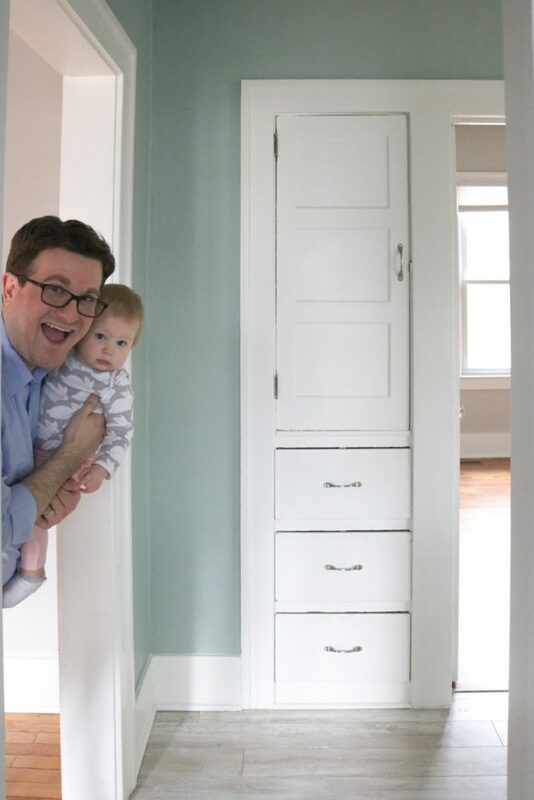 It feels like it has been forever since we shared an update with you about our new house. Ok, maybe not forever. More like six weeks. And oh my goodness, what a whirlwind those six weeks have been. 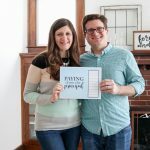 If it seems as though we've been a little absent lately, it's because we've been working our tails off trying to get everything ready in between working outside the home, caring for Dessa, and sharing other content on the blog. Let me tell you, it has been an amazing six weeks. We are now officially homeowners! We closed on the house three weeks ago, repainted several of the rooms, hired contractors for a few projects around the house, and just moved in over the weekend. (I told you it's been busy!) Despite all that, I just couldn't wait another moment to finally share a peek into our home with you. One of the things that we love most about the house is that it was built in the year 1925. Which means it has a ton of character and also a lot of history. Think about it – our house was built during Prohibition in the roaring twenties! Even though the house is only 1,400 square feet, there is a grandness to it that makes me want to know more about the first owners of the house. (But that is different blog post for a different day.) 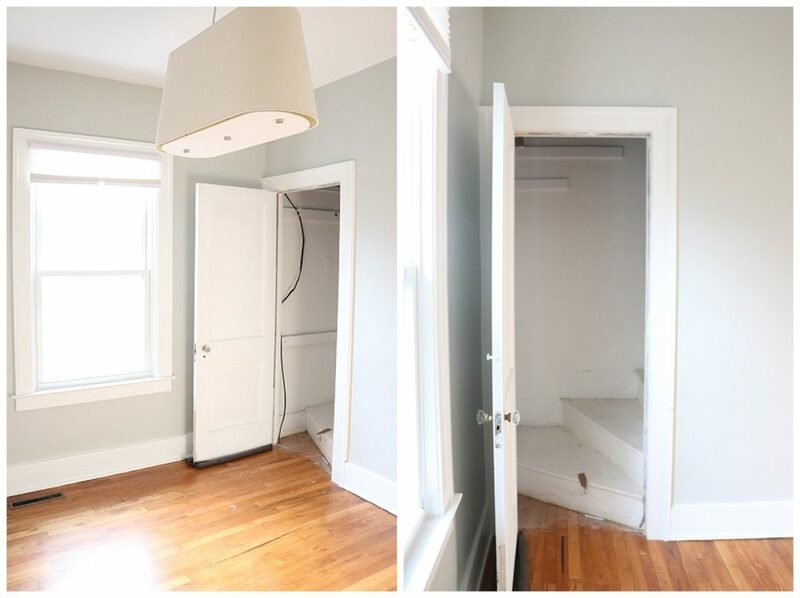 Even though we've already begun to make improvements on several rooms in the house, I took before photos of every room and I want to share some of our plans for the space. Come on in! 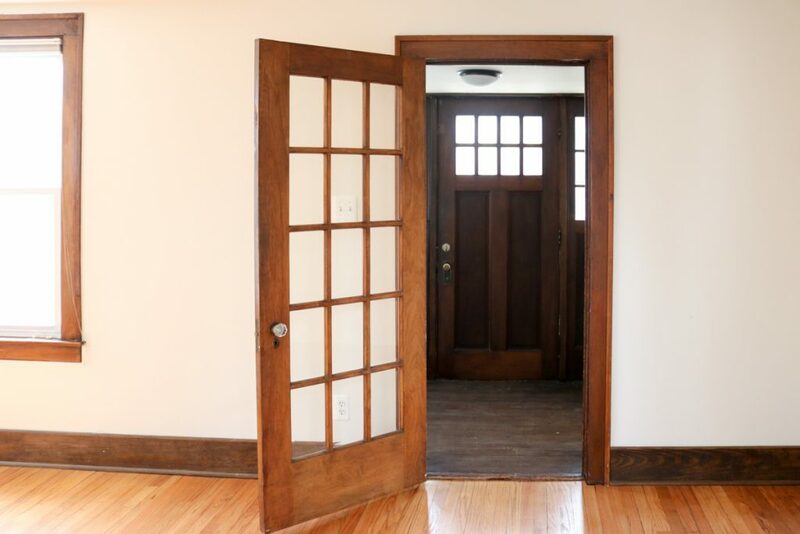 I love, love, love that there is so much wood and trim that has been preserved from when the house was first built – including the front door and the wood floors in the entry way. We don't even have a mailbox – just a cute little mail slot. You can see it under the glass window panes on the left side of the door. 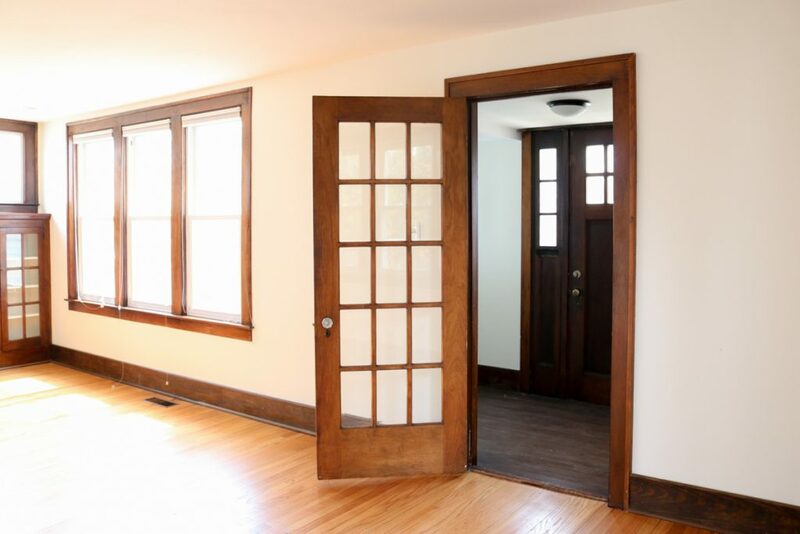 The foyer also includes a little nook to the left that has just enough space for a desk and a few accessories – to the right there is a substantial coat closet. 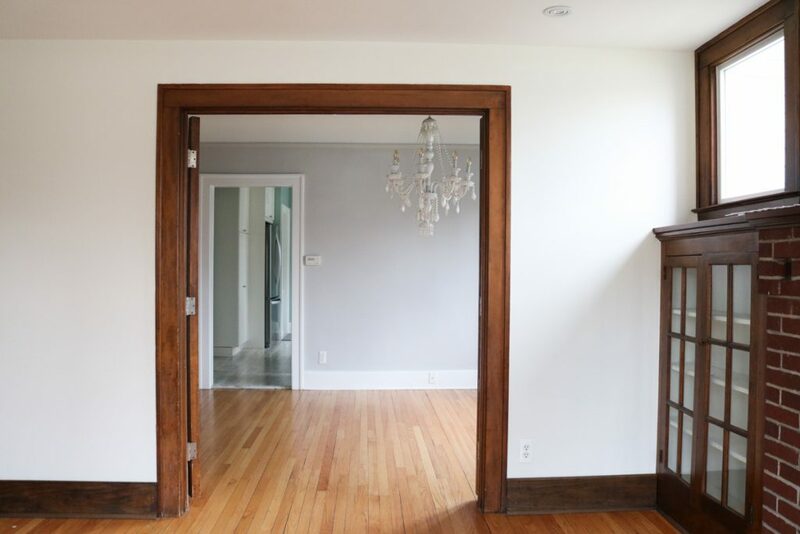 The entire space gets plenty of natural light and it's such a cheery way to welcome guests into our home. 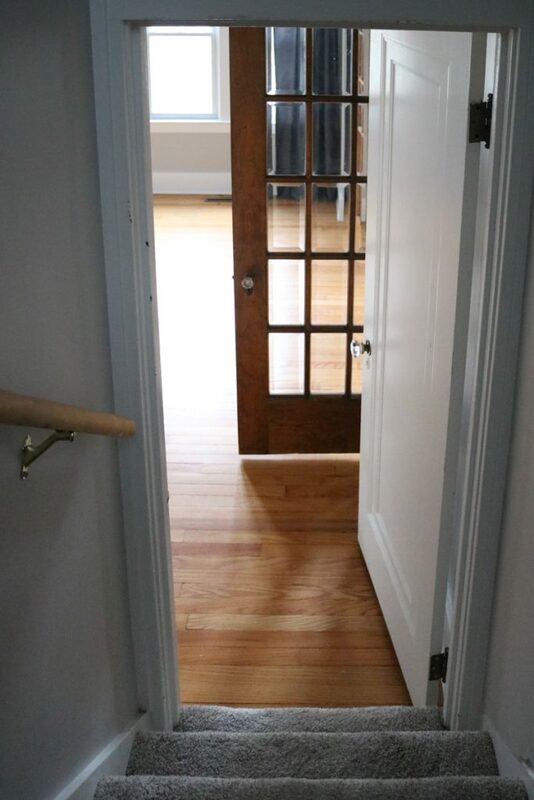 The entryway floors are also original wood and were unfinished when we moved in. They were rough, dry and filled with splinters. One of Rob's first jobs at the house was to finish the floors with a few coats of polyurethane. They now look gorgeous and I can't wait to reshoot this space so you can see how well they shine. 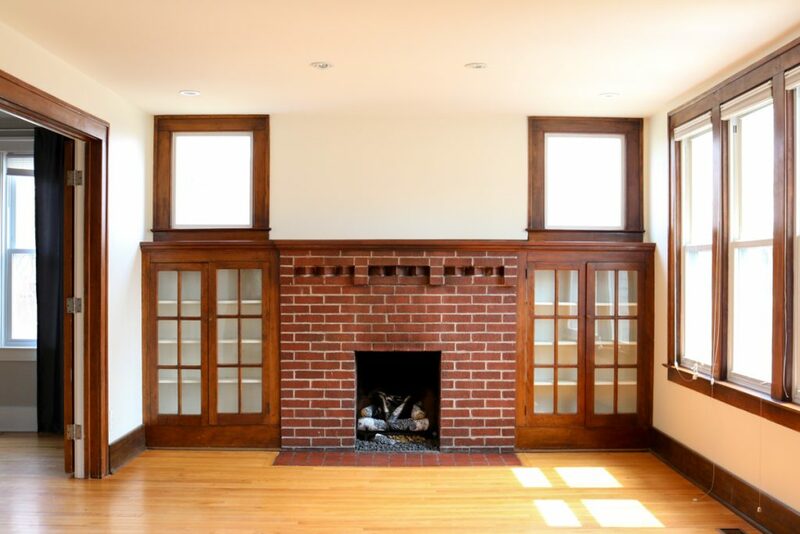 In the front of the living room, there is a gorgeous fireplace with original built-in book cases. This is Rob's favorite space in our home and I know he's just dying to curl up with a book, a fire and a glass of scotch. The back of the living room is pretty simple. We plan to use this area as a little home office/workspace since it's tucked away from the hustle and bustle of the rest of the house. You may be wondering what lies beyond the dark little corner in the back of the room. We were curious when we saw this nook, too. 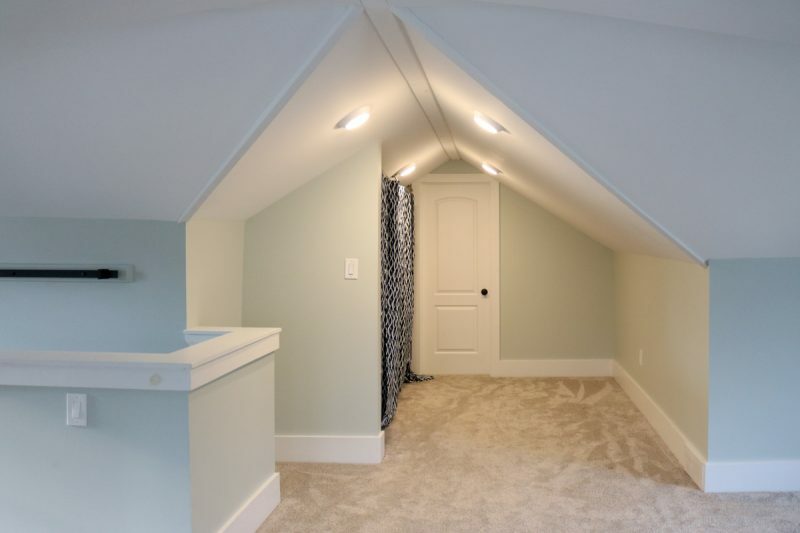 It's actually a little under-the-stair passageway that leads into one of the bedrooms. 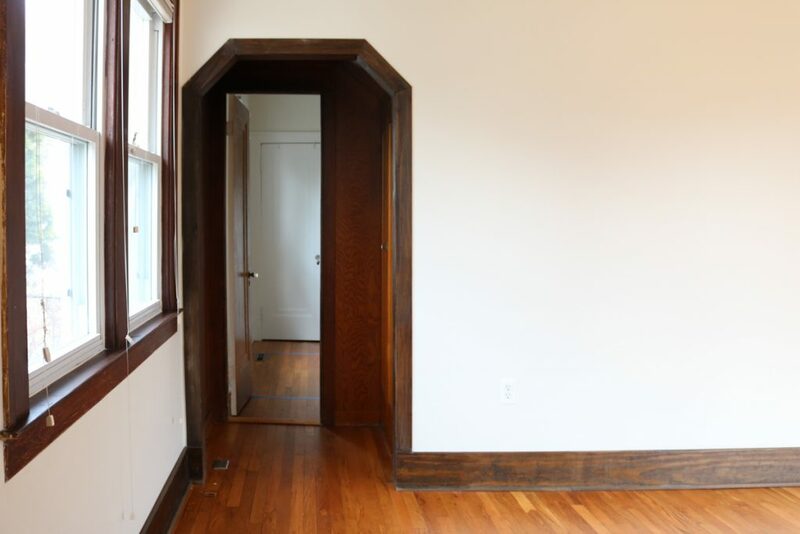 The bedroom also has a door into the house's main hallway, which makes this door unnecessary. We are in the process of walling off the space in the bedroom and using this nook as an additional closet. More photos to come soon! Our little tour continues from the living room and into the dining area. Everyone that steps into the house comments on our chandelier. It is very large and very beautiful but we just can't decide if it's a good fit for the space and our decor. The white chandelier really pops against the navy blue ceiling, which was the source of another family debate. We ultimately decided to paint the ceiling a softer color. 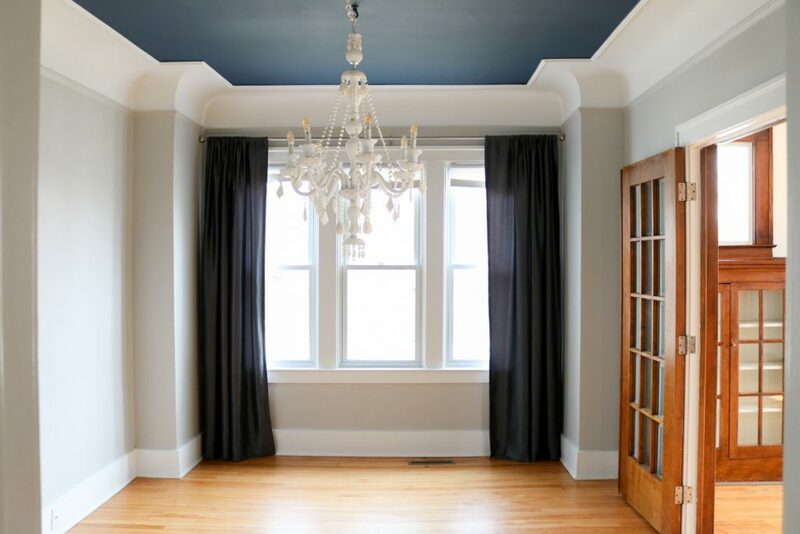 There's a richness to the deep navy ceiling – especially when it's paired with the white glass chandelier, gray walls, dark drapes, and original french doors. 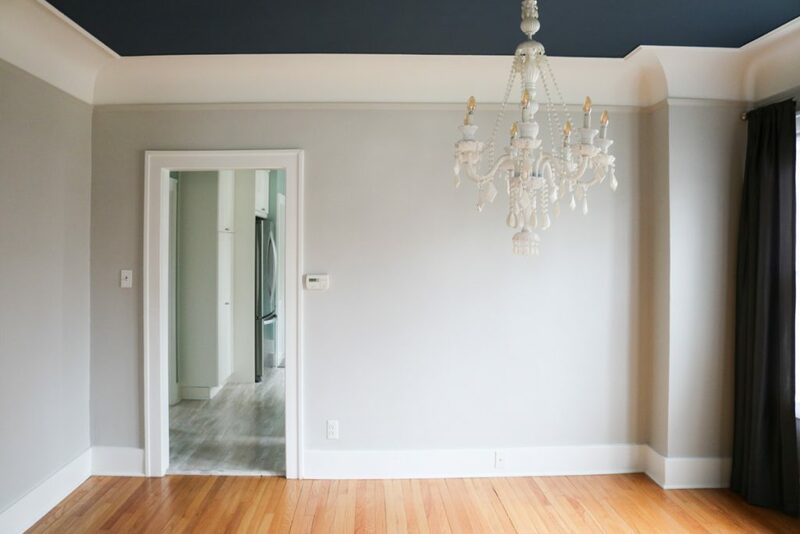 The room looked simply regal and it pained me to paint the ceiling a light shade of gray. But I am so happy I made that decision because – let's face it – we are not regal people. We are a comfortable, down to earth family with a baby. The softened ceiling color is a better fit for our lifestyle, but oh my goodness, it was nice to be regal for a week. Past the dining room is our kitchen and bathroom. 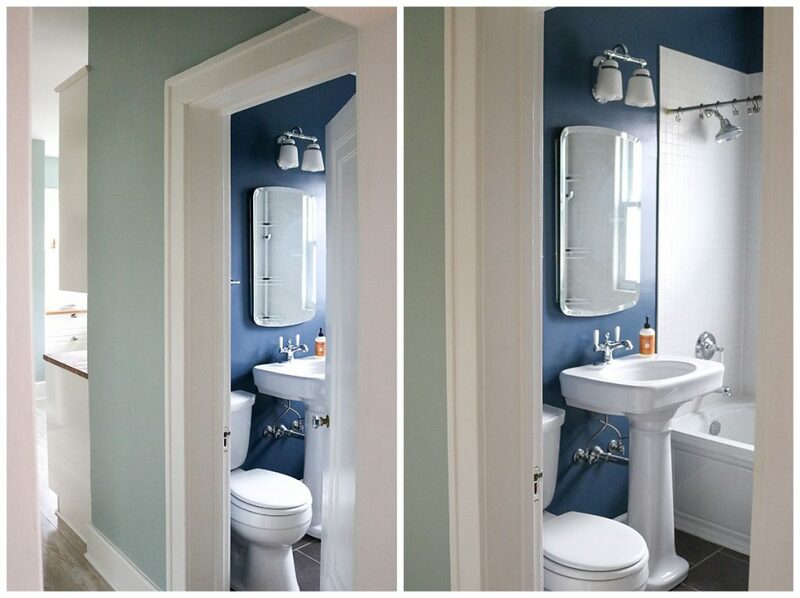 The bathroom walls were painted the same rich navy blue as the dining room ceiling. The pop of deep navy with the crisp white bathroom fixtures was quite stunning. Yes, I said “was”. And yes, we painted over that too. I know that some of you are looking at these photos and wishing you could reach through your screen and shake some sense into me. I promise to show you “after” photos soon, but right now you just have to trust me. The dining room and bathroom are still so beautiful! They're just a softer kind of beautiful. On the other hand, if you read my monthly Stitch Fix reviews, you may not be the least bit surprised to hear about my changes since I rarely even keep clothes that are dark in color. If I can't convince myself to keep a navy blue top, it seems incredibly unlikely that I would ever be able to live in a house with navy blue walls and you are absolutely right! I prefer to vacation in places with fun paint colors. For home, I just love soft colors on the walls. Across from the hall is a cabinet and built in drawers that are also original to the house. Unfortunately, these haven't stood the test of time particularly well so we are planning to update this storage area. Also, how much do you love Dessa's version of a photo bomb? 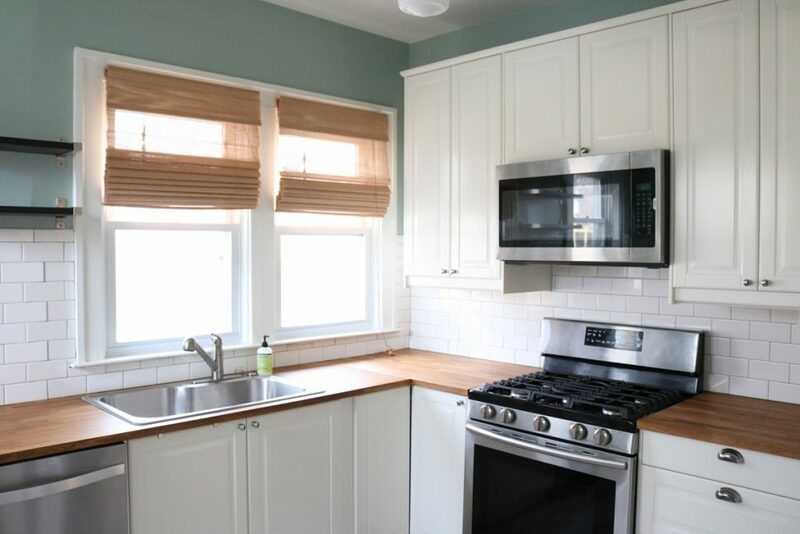 The kitchen is set in the back of the house and the previous homeowners did a beautiful job of remodeling the kitchen. We saw photos of the space before they purchased the house and this is such a tremendous improvement. The kitchen is beautiful, functional, and efficiently makes use of the limited space. 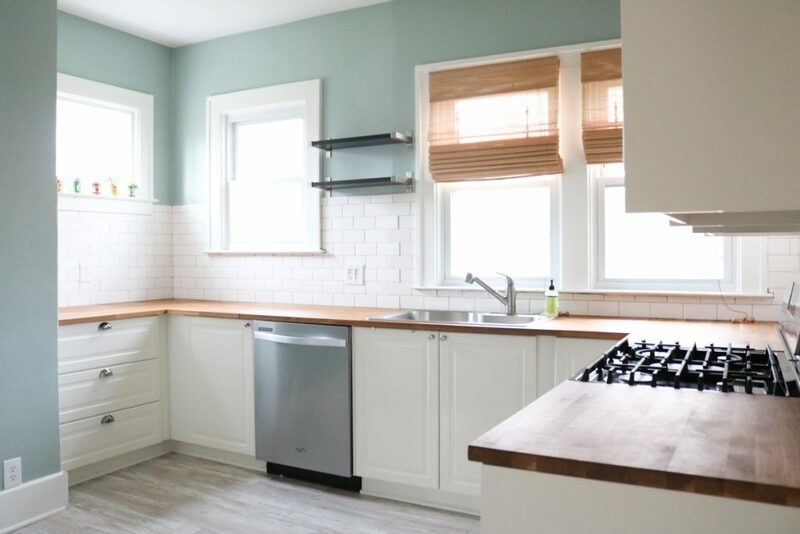 I love everything about this room: the light fixture, the gas range stove and updated appliances, the gorgeous natural light, the subway tile backsplash, the soft-close cabinets – everything! Well, maybe not quite everything. 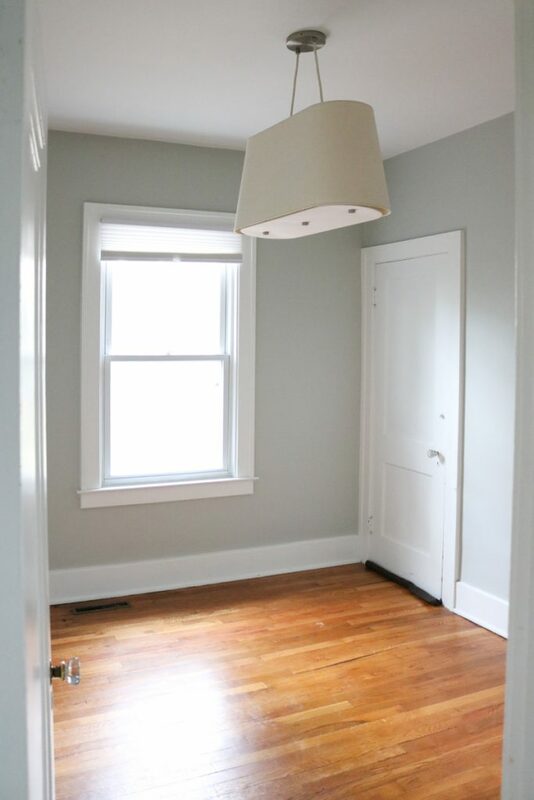 We decided to keep the paint color for now, but I the thought has entered my head that a nice soft “greige” (grey/beige) neutral color could really help to brighten the room later in the day when the sun shifts to the west. I wanted to get all of the painting done before we moved so Dessa wouldn't have to inhale any paint fumes, so this is one project that will have to wait until summer. But don't be surprised if the walls change from green to neutral in the coming weeks. Our house is considered a three bedroom bungalow, with two small bedrooms on the first floor and the master bedroom upstairs. We weren't comfortable sleeping on a different floor from Dessa and it's also important to us that she have her own bedroom, so we decided to occupy both first floor bedrooms and use the upstairs as an additional living area. Both bedrooms are 8′ x 10′ and they each have some interesting quirks. Dessa's bedroom has the connecting door which leads back to the living room. 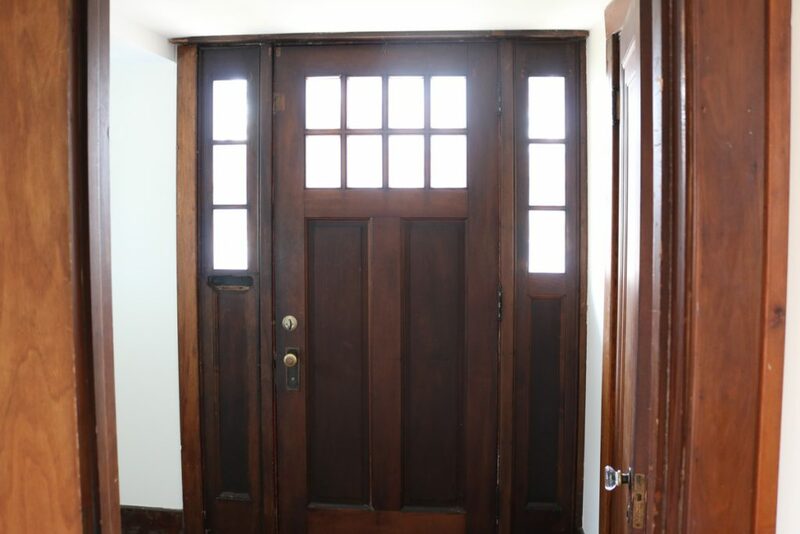 She also has a closet and a separate entrance door from the main hallway. 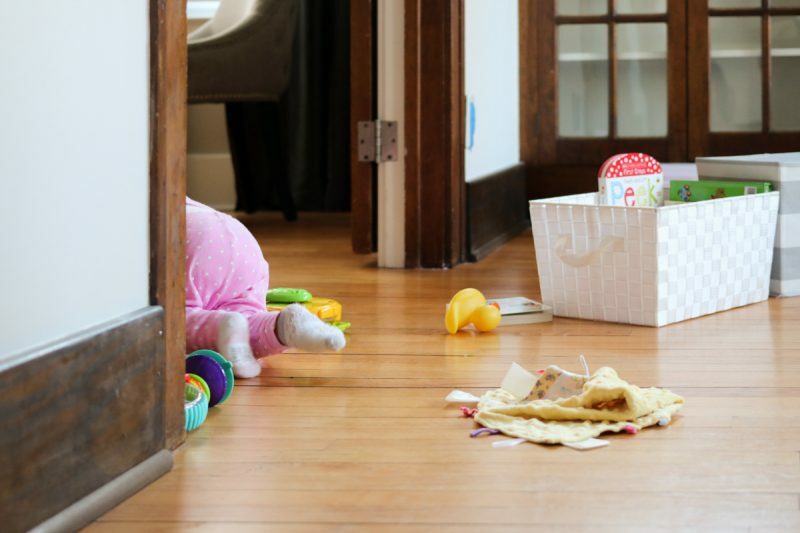 Throw in the window and all four walls to her bedroom have an obstacle to juggle furniture around. For security purposes and practicality, we decided to remove the additional door to her bedroom and drywall the space. Construction is already underway and we cannot wait for it to be complete. 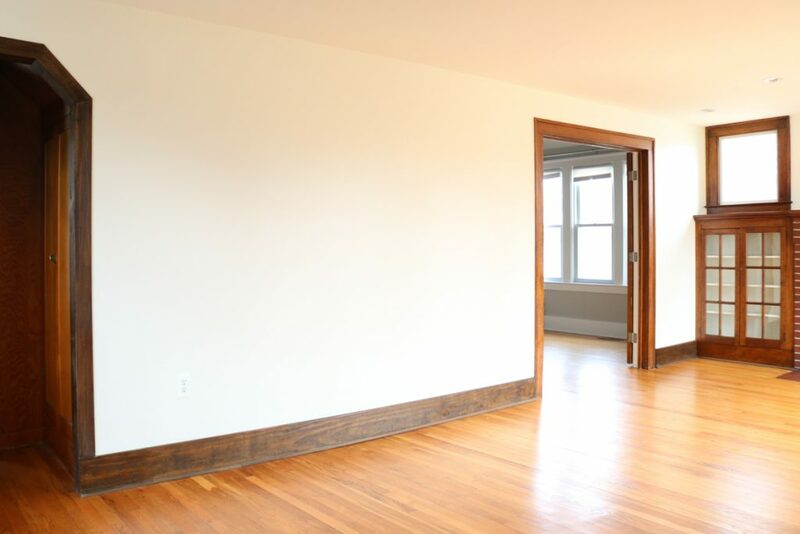 We also gave Dessa's bedroom a fresh coat of white paint to brighten the space a bit. In addition to a closet, our bedroom also has an extra door which leads to a unique architectural feature: a second set of stairs to the second floor. I have all sorts of plans and dreams for what to do with the bedroom, stairs, and the space at the top one day. 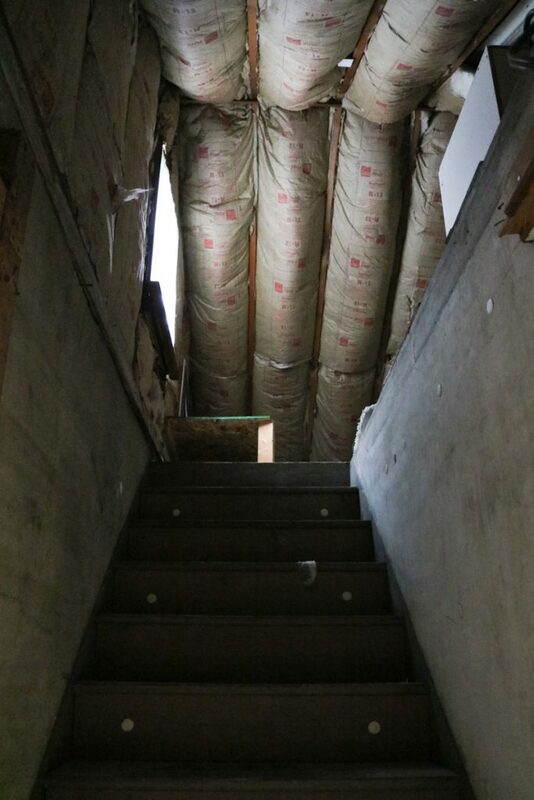 In the meantime, it's just a creepy set of stairs that lead to an unfinished portion of house. I love that this house has room that we can grow into one day. The main stairs to the second floor are located off the dining room. We adore the upper level of our bungalow because it's the perfect cozy space for Dessa to hang out. 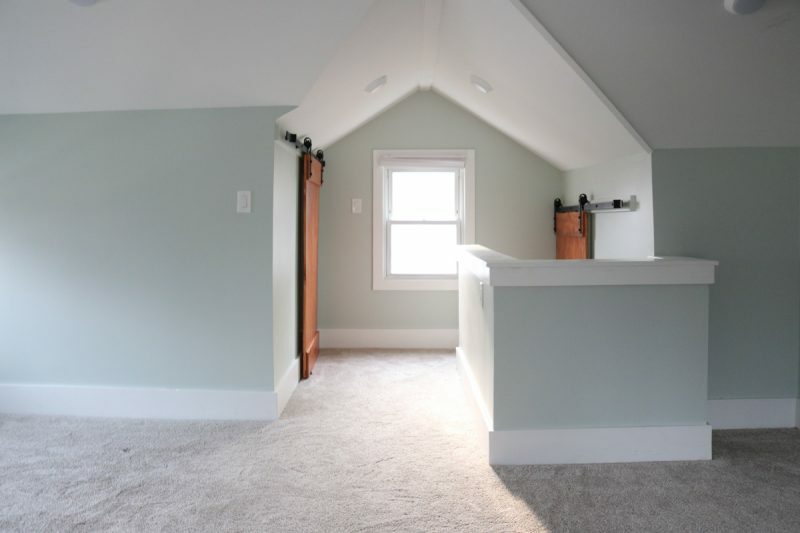 There's a little bit of additional storage with sliding barn doors at the top of the stairs. 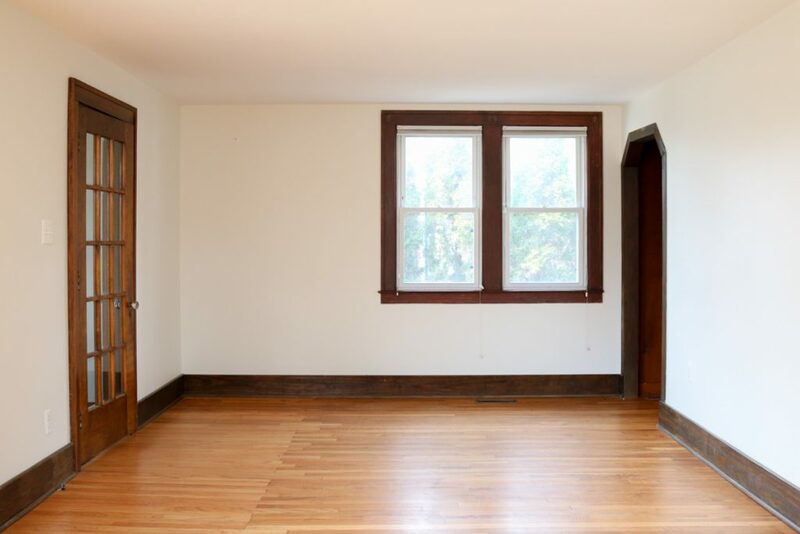 Then the room opens to a central space with a bank of windows that are low enough for Dessa to look out of on her own. We plan to say goodbye to the curtains just as soon as we have a chance to purchase and install a set of cord-free shades for the windows. 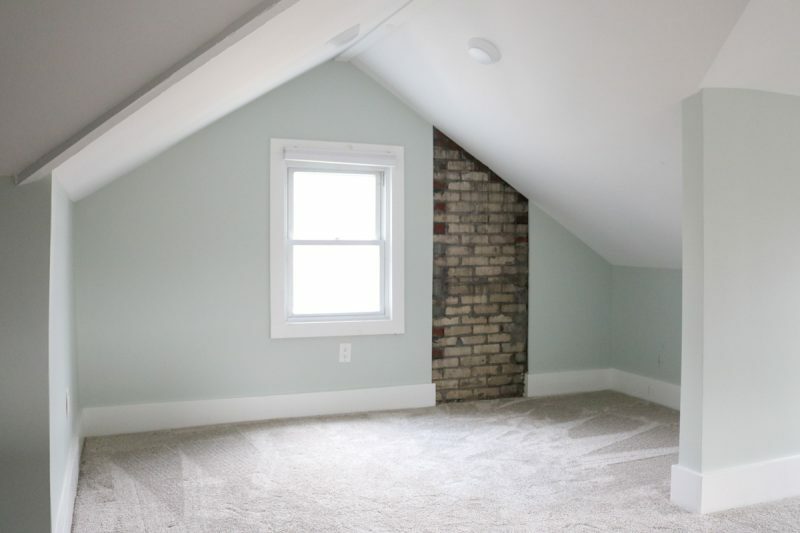 At the far end of the space is a little nook with low sloping ceilings and an exposed chimney from the first floor fireplace. One day soon, we hope to purchase a small TV and love seat for this little corner. The central area will probably be furnished with chairs and an ottoman or coffee table. In the meantime, all that Dessa needs are a few toys, a small table that she can pull herself up on, and a view of the windows. The carpet is well-padded and extra cushy for us to play with her on the floor. 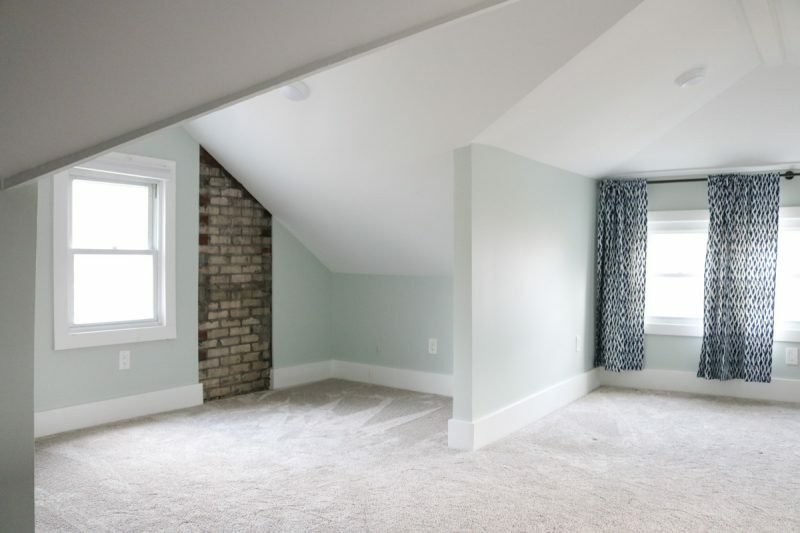 The previous owners used the second floor as a master suite. They set up their bed in front of the bank of windows, had a closet in the back, and had long-term plans to create a bathroom in the unfinished space that can be accessed from the second set of stairs. Rob and I decided to set up our bedroom on the first floor, but the 8′ x 10′ room can't accommodate much more furniture than our queen size bed and two small nightstands. A dresser would be incredibly tight and the closet is quite small. 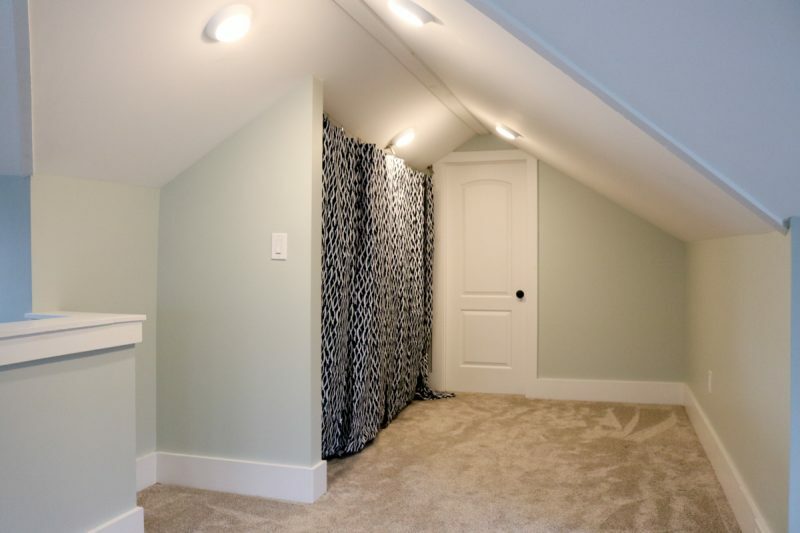 We decided to make use of the existing closet area upstairs for our personal use, but with a few modifications. 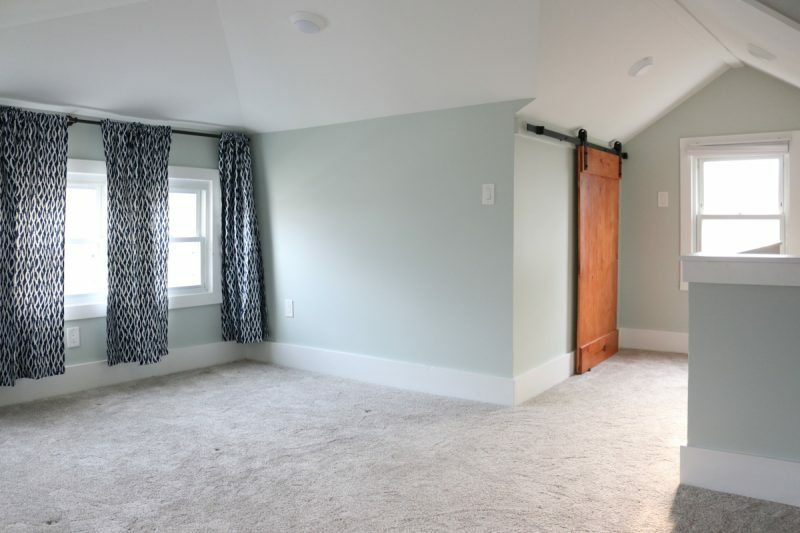 I understand how the curtain was a cost-effective solution for the previous home owners, but I want the closet to be enclosed (especially since I envision using this space for entertaining guests and their children in the future. It seems a little too personal to have our clothes out in the open for a living area. 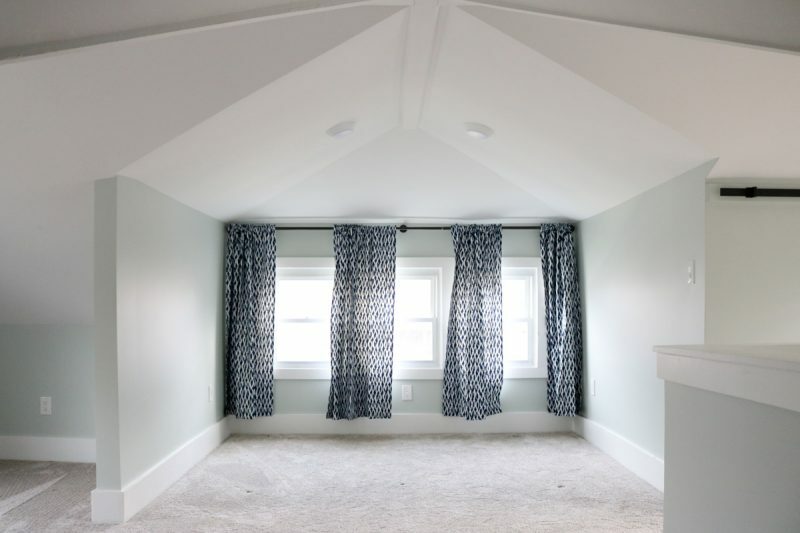 When we brought the contractor out to see the space, he explained that he could construct doors across the closet area, but it would be very expensive due to the custom nature of the walls and low sloped ceiling. 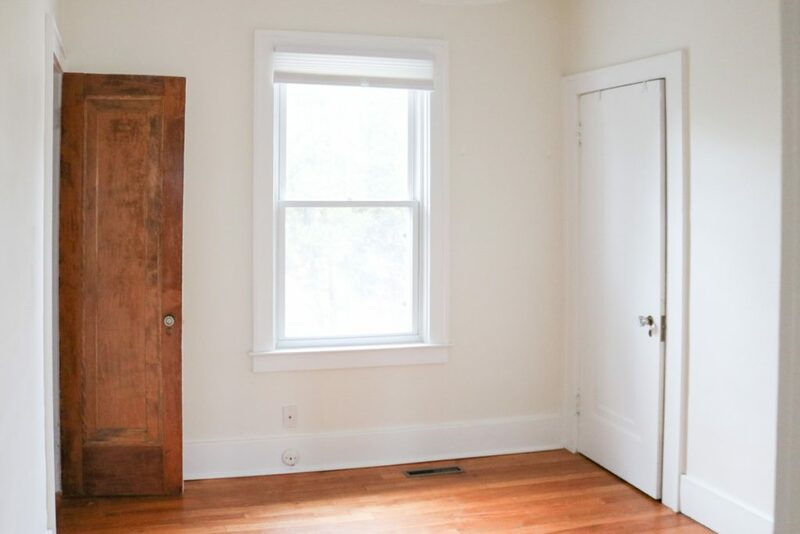 Rather, the contractor suggested that we construct a wall to close off the entire space, install a regular door at the peak that mirrors the existing door in the back of the area, and use the entire space as a walk-in closet. Our mouths just sort of dropped at the suggestion and the wheels in our head started spinning. The contractor wasn't scheduled to begin work for a week, so Rob and I used the time to consider the idea and then we went for it. We even scheduled a free in-home design consultation from California Closets to help us envision the potential of the space. 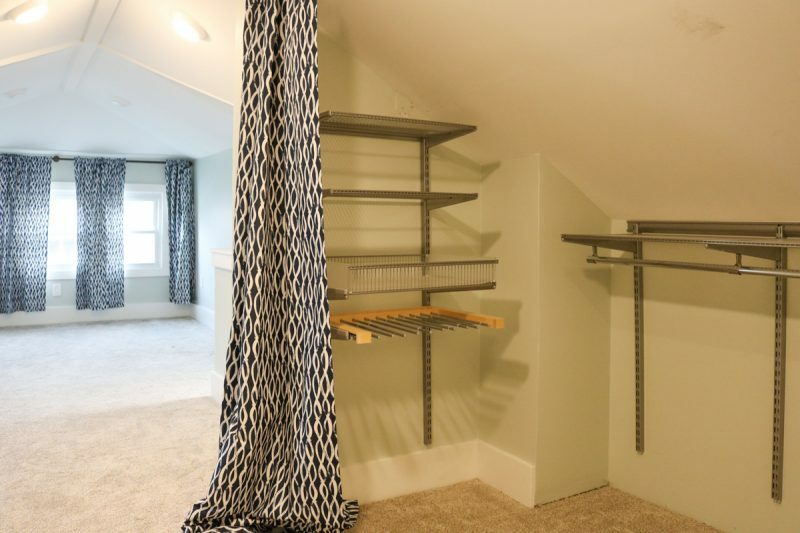 We aren't exactly sure how much we are going to invest in the closet, but we do know that there will be no shortage of storage space for our clothes. Behind the white door lies the unfinished attic portion of the house. There is so much potential for great things in this room! 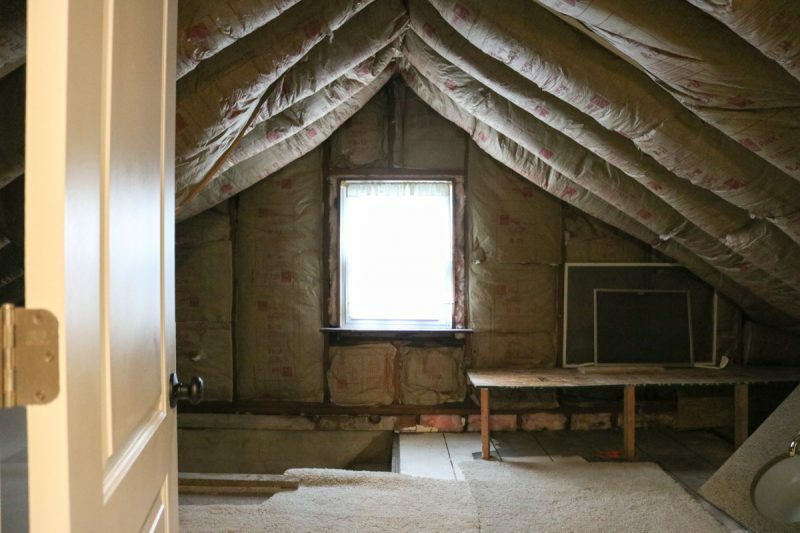 It could one day be transformed into a bedroom, a play room, or a home office. We plan to conquer that area after the house is paid off and we have a clearer picture of our family's needs at that point. As for Dessa, she has acclimated perfectly to the new house. She spent some time here with us before we started painting so she was already familiar with the rooms and layout. 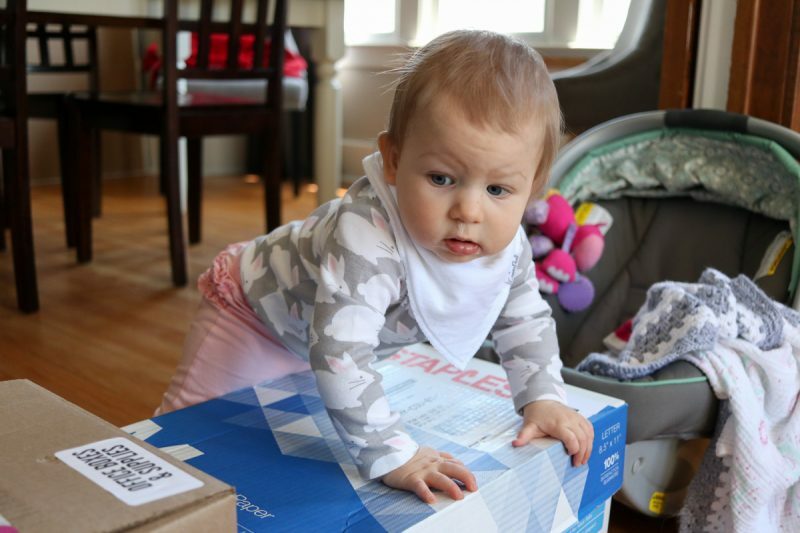 Now that the house is filled with all of our familiar furniture, she's been eager to help us unpack and has been busy crawling everywhere. Life is good in the Gavin household! We can't wait to share more home updates with you once we are settled. In the meantime, we are going to try our best to get some much-needed sleep! How exciting. I look forward to seeing all your changes as you create your “home”. I LOVE it! Old houses have so much charm. It’s just lovely! Lots of neat features, so homey, I think you three will be very happy there! I love all of the details and touches in your new home! Congratulations! I can’t wait to see what you guys do to put your lovely stamp on it. I love your style! I love it! So charming! I love it!! Old homes have such charm and character than what you find in modern “cookie cutter” homes…… they all look alike! Congratulations! Your house is absolutely beautifully! Thank you for sharing, I love seeing homes and especially “befores and afters”! 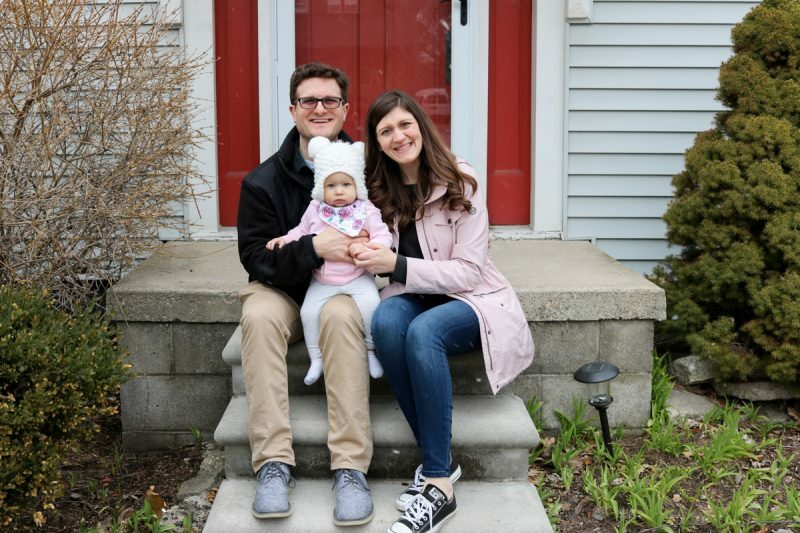 I’m so happy for you guys and congratulations on finding this beautiful home! I love all of the character and to me it seems larger than the actual square footage. Please keep us informed of your journey paying the house off. Exciting times! Would you mind sharing the names of the navy, gray, and white? 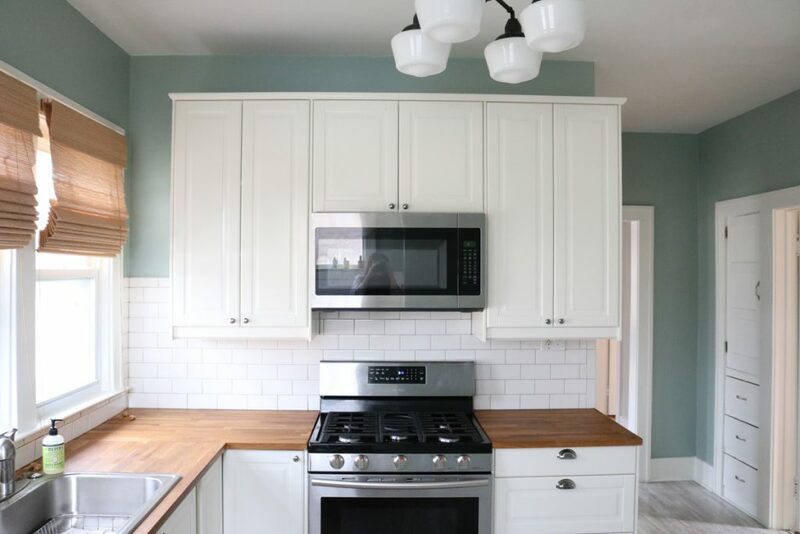 We’re looking for similar colors to repaint our home and are having a particularly hard time with the whites and grays. Thank you! This home is so sweet, I want to cry! I have the softest spot in my heart for older homes and have such a desire for my husband and I to find one for our first home. 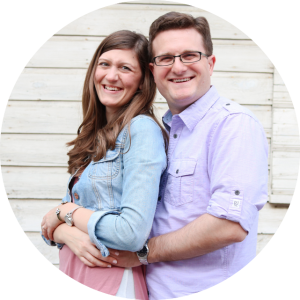 We’re currently searching for a home and have been for about 4 months now…it’s sadly been a defeating process for us (unlike the fun you see on HGTV)! We’re getting more and more lenient, but we have a few boxes we want to check that we don’t feel comfortable budging on (size, location, etc. ), and we just can’t seem to find the perfect place yet. We don’t want to settle and buy a home just to buy a home. 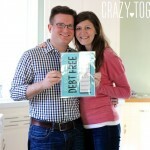 We want to love the place we will live for some time and will be spending so much money on! All that to ask: Did you run into any issues with the age of this house, like outdated wiring? We’ve seen two older homes (one we just LOVED), but they’ve both had outdated wiring. With them being at the top of our budget, we don’t feel great about the risk involved if something were to go wrong with the wiring (and not to mention the safety aspect, considering we hope to start a family in the home). If you did, how did you handle that? If not, score for you guys! 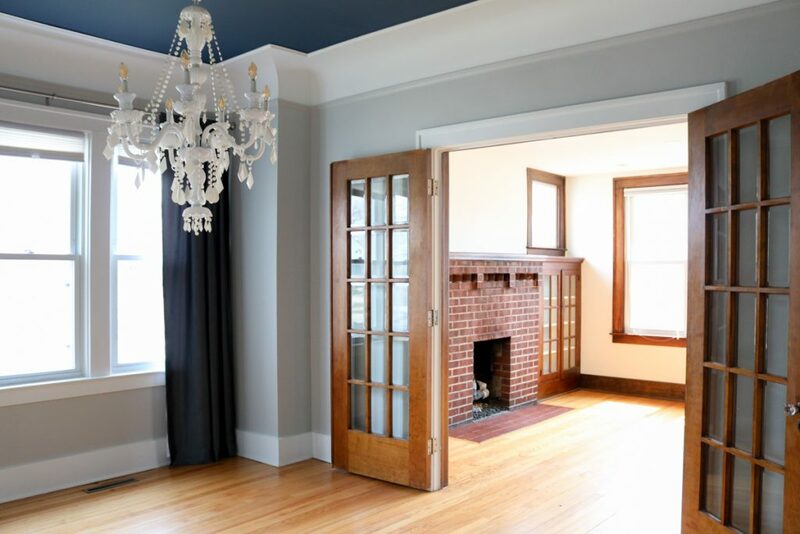 Your home is just beautiful – quaint and with old character, but beautiful updates too! 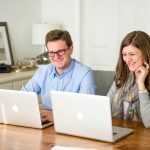 Hi Courtney, I completely understand your frustration and I can’t believe we found our home as quickly (and accidentally) as we did! We were a little nervous about what our home inspection would uncover, but thankfully there weren’t any red flags. Just a list of small repairs and improvements to make that are similar to what you could even find in a newer home. It is apparent that the previous homeowners poured their love into the house. The wiring in our home isn’t an issue, but I don’t blame you at all for hesitating to purchase a house with old wiring or other potential safety issues. As difficult as it is, try not to compromise and to stay strong (unless you have the money to overhaul the safety concerns right away). This house truly is a blessing and would ordinarily be out of our price range. The only reason we were able to afford such a great quality house is because it doesn’t have a garage (which really kept the price tag down). We hope to build a garage one day, but probably not for at least a few years. I hope you find the house of your dreams soon and that it is one that you doesn’t require you to settle! That’s awesome! Congratulations on finding that treasure! 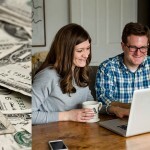 I appreciate your encouragement :) We’re trying to source advice from budget-conscious people who are living in homes similar to the ones we’re looking at. While your house sounds like it’s overall a better buy, I do still appreciate your advice and find it helpful! 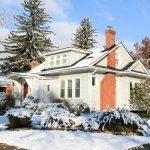 I can’t wait to see how you all love and grow in and with your home!